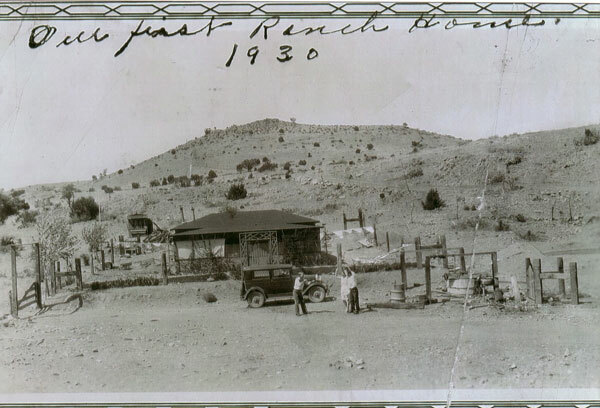 The Ranch lies at 5100’ elevation, just west of the Continental Divide in southwest New Mexico. Although mountainous, the land is primarily rolling Chihuahuan grassland, one of the most biologically diverse arid regions in the world. 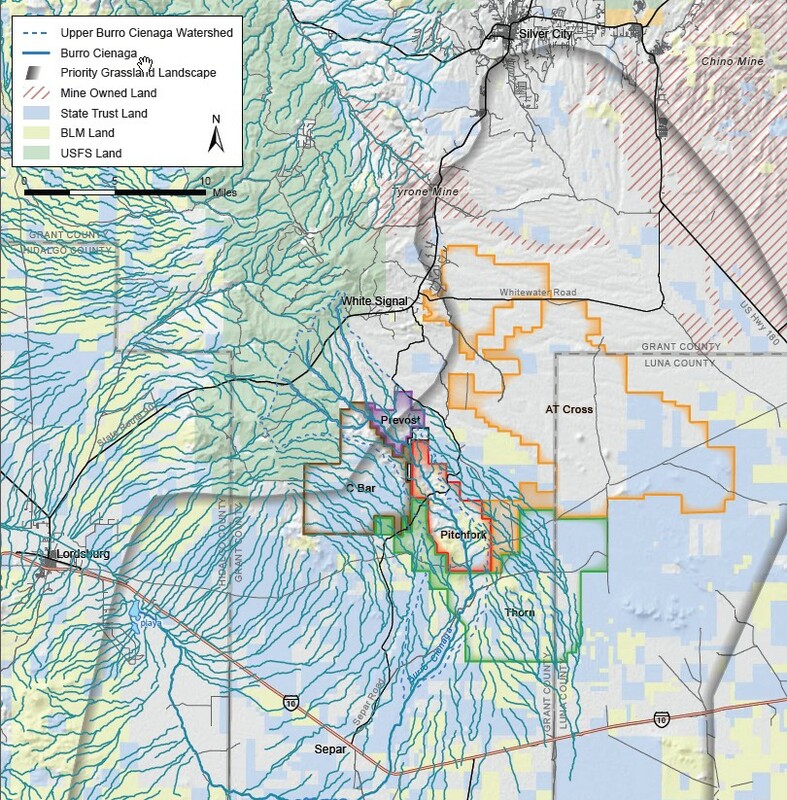 A one-hour drive south of Silver City, the Pitchfork is six miles from the nearest neighboring ranch and consists of slightly less than 12,000 checker-boarded, split-estate acres, 5,160 deeded, the balance state and BLM lease land, as shown on the Pitchfork Area Map below. The dominant landmark is Soldier's Farewell Hill (6173’) near the historic Butterfield Trail and way station #19. In the late 1880s, this land was part of the historic “Diamond A Ranch” or “Gray Ranch” in the New Mexico Bootheel. Later known as the "McDonald Brothers" or "Bart McDonald place," these lands have been in cattle production for well over a century. In 1903 a Civil War veteran gave 5-year old Bartley McDonald a heifer, registered the three-pronged "pitchfork" brand for the boy and thus the ranch name and brand. "Native grasslands are now among the world's most endangered ecosystems." "Springs ecosystems (which include ciénagas) are among the most threatened ecosystems on earth." This ranch has both. Archaic peoples, Mimbres, Apache, Spanish and finally Anglo settlers lived along the 48-mile long Burro Ciénaga, a unique desert wetland and the ranch’s most important feature. A Spanish term meaning "slow moving water or marsh," the ciénaga is perennial and bisects the ranch north to south, two miles above ground, seven miles balance subsurface, fed by perennial Ojo de Inez (now Ciénaga Spring) and canyons that drain from a 58-square-mile watershed. Extreme flood and drought cycles, eradication of beaver, sheep and corporate cattle overstocking in the late 1880s, agricultural re-contouring and the absence of fire have dramatically altered the area's natural marsh balance and deeply entrenched the ciénaga. The northern quarter (that we are “re-wilding”) and southern three-quarters of the ranch, about 3,000 and 9,000 acres respectively, are set apart by Separ Road, a Grant County dirt road that runs 30 miles from the towns of White Signal on Highway 90 to Separ on I-10. The Pitchfork — surrounded be seven ranches, with no urban encroachment — is midway between the two. Raised in Phoenix, living in Casa Grande, Arizona, for 32 years, we bought the ranch in 2003 and retired to the property, permanently living at the ranch headquarters. 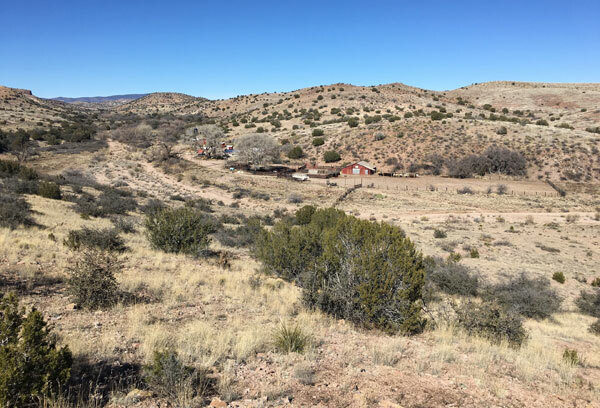 We are following restorative management practices, planning to leave the ranch to an entity that will maintain its historic integrity, support ranching, honor the conservation easement and protect these open spaces. The overarching goal for this ranch is habitat repair, using "flood-n-flow" based restoration practices and accompanying sediment deposition to nudge the ciénaga and surrounding land toward its pre-settlement condition — to get the water back. Ongoing installation of grade control structures is helping the ciénaga and surrounding land reclaim itself and reconnect surface and groundwater. Goals are to: refurbish the headquarters while retaining its historic character, monitor photo points and piezometers, perform water and soil data collection and mapping, raise the ciénaga bottom, restore transitional and uplands, improve infiltration rates, fix roads, rebuild the cattle herd, provide science, research and education, protect the archaeology, improve habitat for wildlife and imperiled plants and animals, restore low-intensity fire and prevent range land fragmentation. Existing wildlife include mule deer, pronghorn, peccary, skunk, raccoon, coati, fox, badger, rock squirrel, 12 species of rodent, mountain lion, black bear, elk and over 140 bird species. The listed aplomado falcon, Gila topminnow, Chiricahua leopard frog, and candidate species Wright's marsh thistle have been reintroduced. The Euphorbia rayturneri, a previously unknown plant, was found here and the ranch is currently the only place on the planet where it is known to exist. Installed 214 grade control structures in the Burro Ciénaga and some 489 in the 33 side drainages. Captured 50,000 tons of sediment. Raised the floor of the Burro Ciénaga channel two feet in most areas. Raised the water table in the ciénaga 11 inches. Removed cattle from five miles of the Burro Ciénaga. Introduced the endangered aplomado falcon, Gila topminnow, Chiricahua leopard frog, and candidate species Wright's marsh thistle. Removed three large cattle-watering dirt tanks and restored two. Discovered the Euphorbia rayturneri, a plant previously unknown to science. Adopted a fire management plan for the reintroduction of fire. 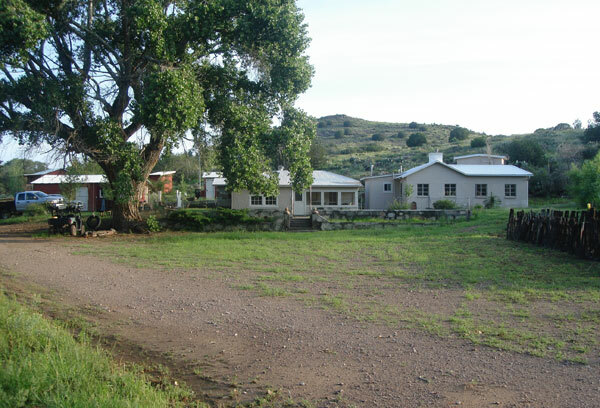 Identified 21 Mimbres sites along the ranch’s nine-mile reach of the Burro Ciénaga. Scientists maintain lists of species on the ranch for birds, mammals, amphibians, reptiles and fish, moths, butterflies, plants and grasses. Published a paper for the Gila Symposium on restoration on the Pitchfork Ranch and a second paper on Ciénagas. Wrote a Wikipedia article: Ciénega. 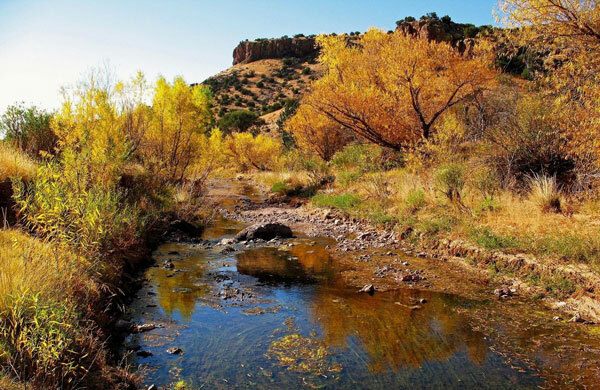 Pursued establishment of a Ciénaga Working Group with the New Mexico and Arizona Fish and Wildlife Services. Received 14 grants for ranch restoration and introduction of endangered species. Installed a series of 11 piezometers, devices hung in pipe-driven monitoring wells that measures various aspects of groundwater. Given a dozen PowerPoint presentations on restoration and ciénagas. The ranch received the 2013 American Fisheries Society, Arizona/New Mexico Chapter, Conservationist of the Year Award. Brandon Bestelmeyer of the USDA-ARS-Jornada Experimental Range in Las Cruces, NM completed ecological site and soil mapping of the ranch. Maintained same location/same day repeat photography in four directions at 33 locations for a decade. The ranch has a herd of Charolais (white coat) cattle that are grass fed and grass finished, running 15 degrees cooler than black cows, important in the Southwest because of climate change. Provided education or study opportunities for several dozen classes and groups ranging from grade school to post-doc. We have a pending request before the Bureau of Land Management for the ranch’s federal land to be designated as an Area of Critical Environmental Concern.